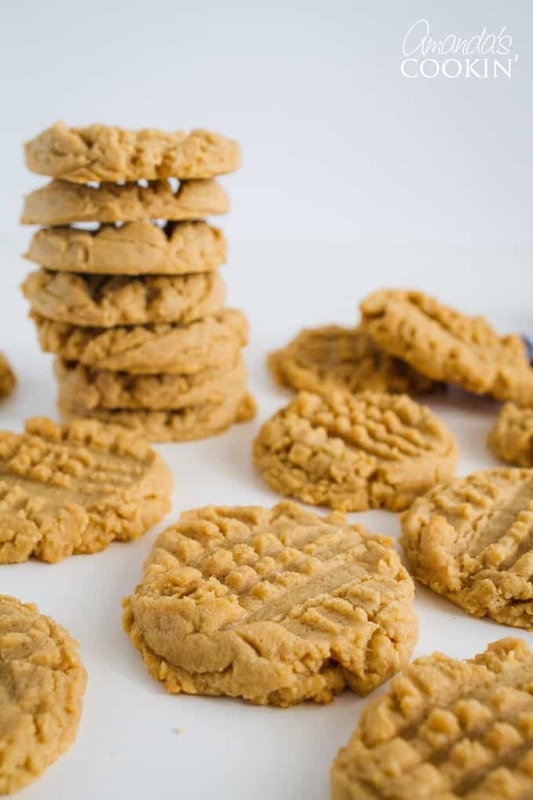 There’s a foolproof way to bake soft and chewy peanut butter cookies. That’s to under bake them slightly. That’s it. 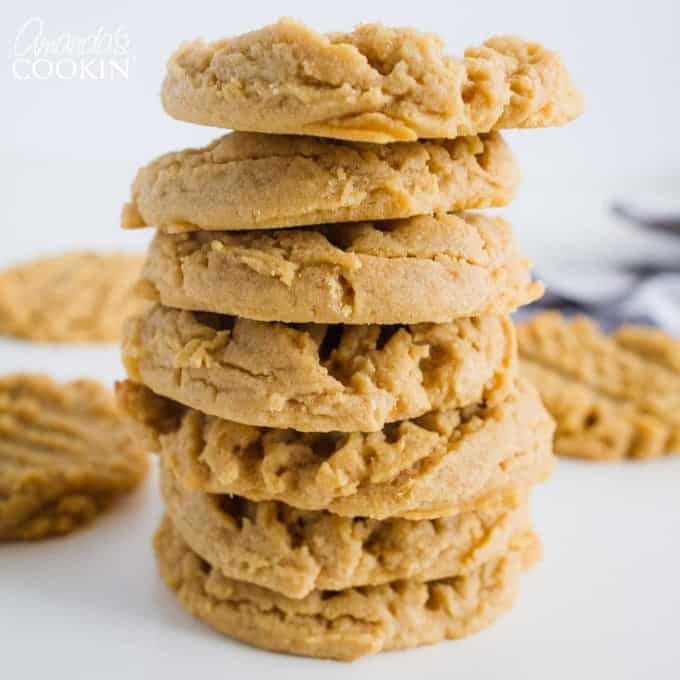 Baking a batch of peanut butter cookies until they “look” done is deceiving and creates a crunchy result. 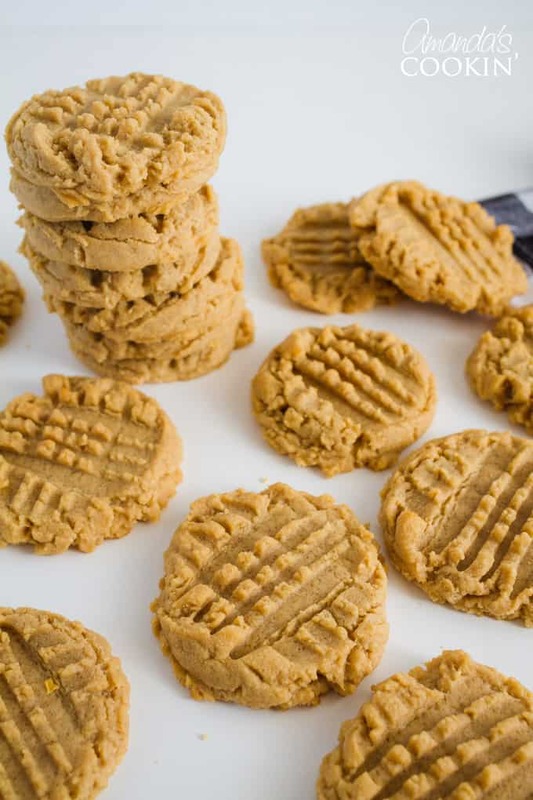 I’ve had this peanut butter cookie recipe in my binder since my kids were little, and my oldest is 25. Whenever my father in law would visit he would ask for these cookies. While we love making these peanut butter chocolate chunk bars, the classic peanut butter cookie is the bomb. My entire family loves them and anyone else who happens to try them does too. They never make it off the cooling rack and into a container, they are always devoured too fast! You can make your cookies nice and neat or give them a more rustic look, either way, they taste great. For neat as a pin cookies, scoop the dough out with a cookie scoop and roll the dough lightly in the palms of your hands. For rustic, just release from the scooper and leave as is. There is shortening in this recipe (I discovered several years ago this recipe originates from the back of the Crisco can). I have used both plain vegetable shortening and butter flavored shortening, however, I have never tried substituting butter. As the saying goes, “If it ain’t broke, don’t fix it!” ;) If you would like to try with butter, I’d love to hear your results. When you bake these, start with a small batch and check them after 7 minutes. Mine are always perfect at 8 minutes. They will look a little underdone and puffy. Once you remove them from the oven and let them cool a bit, they will relax and settle. Try my tweaked Nutella version of these – Peanut Butter Nutella Cookies. Maybe you prefer a Chocolate Peanut Butter Cookie! These Peanut Butter Corn Flake Cookies look amazing too. If you prefer not to bake, these Peanut Butter and Corn Chip No Bake Cookies are right up your alley! 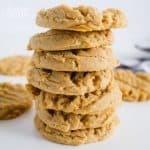 This post was originally published on this blog on May 25, 2010.
Who doesn't love a fresh batch of homemade soft and chewy peanut butter cookies? Well if you're someone who does, we've got the perfect recipe for you! Bake for 7 to 8 minutes, or until set and just beginning to brown. DO NOT OVERBAKE. Cool 2 minutes on baking sheet. Remove cookies to racks to cool completely. Are you sure it’s not 1 TEASPOON of vanilla? A tablespoon seems to be rather a lot…. These cookies are excellent!! Thanks for the recipe…it’s a keeper! 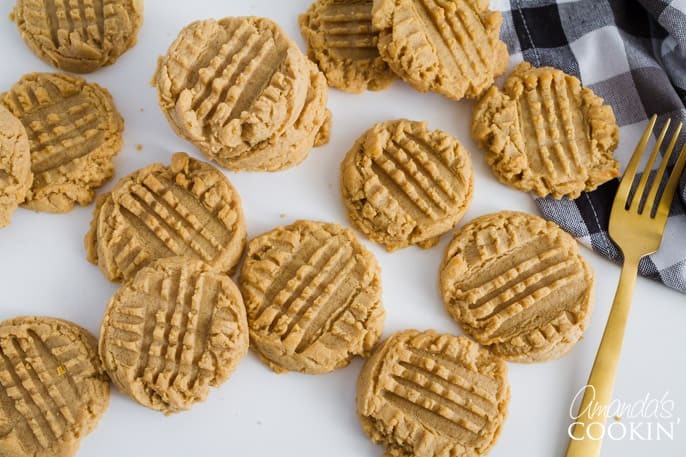 Can you make peanut butter cookies without shortening and made 24 cookies? I have heard of others using just butter. I have not personally tried it myself, but others have said it works fine. This hands down the best peanut butter cookie I have ever made. And at Abe 65 and a lot of cookies baked that’s saying something! I cannot sleep so I was going to bake my husband some cookies. I was sad to find that I didn’t have any butter. I came across this and have used this recipe before. However, I have never tried adding chocolate chips to it. Can you add chocolate chips to this recipe without any other alterations? Thanks. I have not tried that, but I think it could be done. In fact, now I want to try it! YUM! These cookies look delicious! These are in the oven right now and I can’t wait until they’re done!!!! 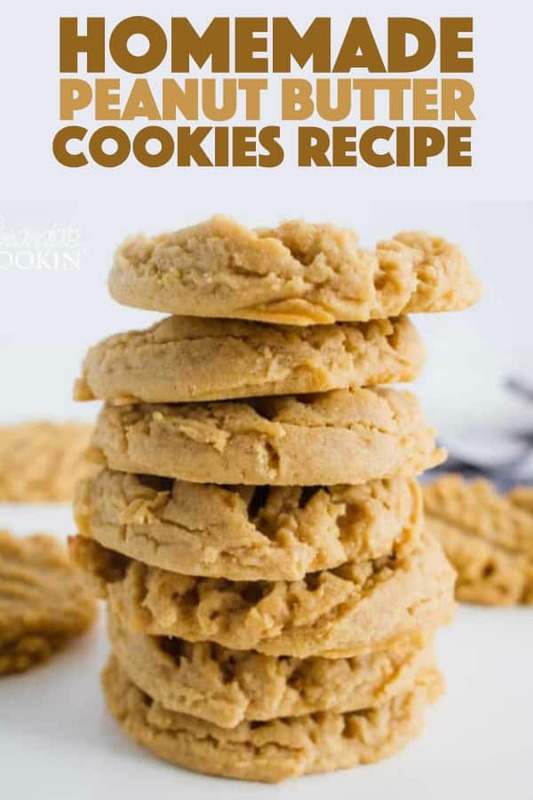 Judging by the cookie dough (I can never help myself) this will be my new go-to recipe. I added some semi-sweet chocolate chips to cater to my tastes. Thank you for this wonderful recipe!!! How many cookies does this recipe make? Need to gauge whether I should double for the size of our crowd. I’ve used this recipe from the Crisco can for years….and have never found one that even compares. This recipe is THE VERY BEST! I just tried these. I made the Nutella version, but since I didn’t have Nutella, I used chocolate spread instead. They. Are. So. Good. OMG, I love them. Thanks so much for posting the recipe, these are going in my recipe book for many future uses. So glad you liked them Sarah, thank you!